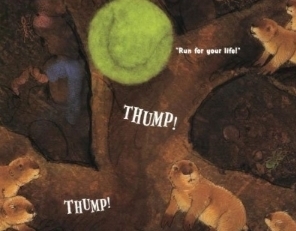 It all begins when Violet the dog drops her tennis ball down a prairie dog hole. The fearful prairie dogs soon discover, thanks to little Pip Squeak, that the scary round "thing" isn't scary at all--it's FUZZY! A fuzz frenzy erupts as the prairie dogs pull off the fuzz and adorn themselves with lime-green fuzzy creations, much to the disgust of Big Bark, the meanest dog in down. Soon prairie dogs from all around hear of the fuzz and come to get their share. But what happens when the fuzz runs out? THE GREAT FUZZ FRENZY was the winner of the 2006 Wanda Gag Book Award. The citation, sponsored by the Curriculum Materials Center at Minnesota State University Moorhead, is for the best picture book of the year to read aloud to younger children. For more information on the award, go to the library's website. 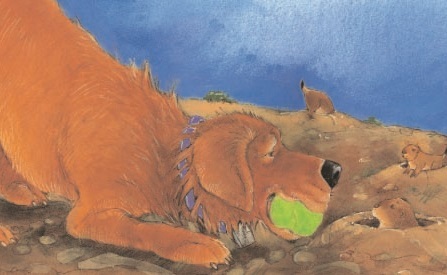 "The marvelously rendered mixed-media illustrations, with vivid blues, earthy browns, and that luminescent green, capture the true fuzzy nature and greenish glow of the ball. As in the author's popular Tops and Bottoms (Harcourt, 1995), this book employs both horizontal and vertical spreads, effectively taking readers deep into the underground realm. A wonderful addition for storyhours, this title will be requested again and again."